It took a while for Las Vegas Events to figure out the most efficient way to move thousands of rodeo fans from hotels up and down the Strip to the popular National Finals Rodeo at the Thomas & Mack Center every December. It took a while for Las Vegas Events to figure out the most efficient way to move thousands of rodeo fans from hotels up and down the Strip to the popular National Finals Rodeo at the Thomas &Mack Center every December. Early on, there were no shuttles at all. Then, Las Vegas Events charged fans for the bus ride. Finally, six years ago, the nonprofit organization that promotes the multiday rodeo figured it out. Las Vegas Events hired Herb Warren of Global Passenger Transportation Logistics Solutions to coordinate the entire bus shuttle system. Now, more than half of the 17,500 fans who pack the University of Nevada, Las Vegas arena every night to watch the bull riding, equestrian displays and roping events come and go via the shuttle. The free shuttle service initially cost Las Vegas Events about $175,000 and now the bus bill hits $350,000, Las Vegas Events President Pat Christenson said. But hiring Warren has been worth every nickel, Christenson said. “It’s a science. If we had to go out and get 65 buses and decide how to put it together, we’d be in trouble,” Christenson said. “He brought the concept of managing the whole thing and purchasing all the buses, and we got the best dollar for our bottom line. We had one person coordinating the ingress and egress. So, it’s Warren who provides the one-stop service for Las Vegas Events, deploying 65 buses along 21 routes to deliver thousands of fans every night in car-centric Las Vegas. Warren was born in Brooklyn, N.Y., and grew up in New York City before owning a motor coach business in Los Angeles. He arrived in Las Vegas a decade ago. Warren declined to give his age, but he did grow up in Brooklyn when the Dodgers played in his native Big Apple borough. Warren moved to Scarsdale in suburban Westchester County before heading West, just like his beloved Dodgers. He is a father of four and graduate of Erasmus High School in Brooklyn’s Flatbush neighborhood. Warren’s bus service is credited with improving the traffic flow to and from the arena. Before the free shuttle service, it took 90 minutes to two hours for cars to clear out of the Thomas &Mack parking lot, Christenson said. Now with the free buses moving fans to hotels up and down the Strip, the congestion dissolves in about 45 minutes, Christenson said. The NFR began Thursday and runs through Dec. 14, with a packed house of 17,500 expected nightly, Christenson said. 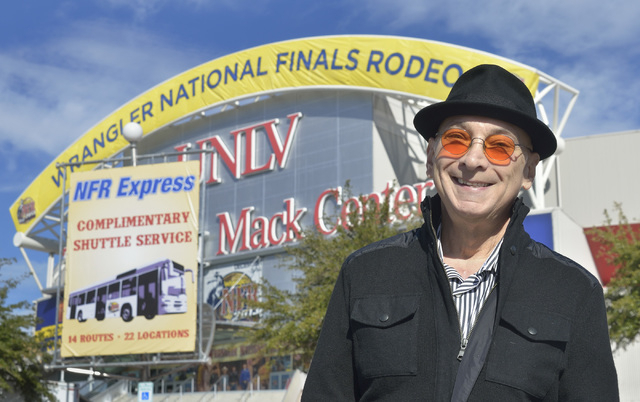 Question: What’s the biggest challenge to move tens of thousands of people on a daily basis to the Thomas &Mack Center for the National Finals Rodeo? Answer: From my end, there are no challenges. What we do, we do it well. If there was a challenge, it’s getting all the information from the event organizers in an efficient time for us to put it together. The day-to-day operation goes pretty fairly smoothly for us. Question: What makes a good shuttle bus driver? Answer: Attitude, safe driving, getting involved with the event that the driver is serving. We want the drivers to feel that they are an integral part of the event they are serving. If they don’t have a good attitude, they won’t be selected as a driver. Question: How many shuttle buses are deployed to serve the NFR? Question: How can you get even more people to take a bus shuttle to the rodeo? Answer: I don’t know. Our numbers have gone up every year. It’s a free shuttle. We have plenty of buses at the host hotels. That’s something you should ask the organizers. Question: Why don’t more people take shuttles to venues around Las Vegas? Answer: Locals don’t see the need. They’d rather get in their car and pay the parking fee. The think they can get home faster. (For the NFR) people who are local would have to get to the host hotels and then pick up a shuttle. That’s why many events don’t offer shuttle services if it’s primarily locals. Question: How long have you been doing the NFR? Answer: About six or seven years. Question: What have you learned during this time? Have you tweaked your plans through the years? Answer: We have tweaked to make it better and more efficient. Sometimes, it means changing the route structure. Sometimes, it’s how many buses are assigned to each hotel. The basic operation doesn’t change. Question: How many locations are on your routes. How many host hotels? Answer: We have 21 routes altogether. Question: How much have you invested in developing the routes, hiring the drivers, getting the buses? Answer: I can’t provide a budget. It’s based on the number of buses, the drivers and the staffing at the host locations. Question: Does your company work other sporting events in Las Vegas? Answer: We do the USA Sevens rugby tourney. We transport the spectators to Sam Boyd Stadium. Question: How did you create this business? Answer: It’s really a niche market in Las Vegas. Some people are party planners. Some people book restaurants. I decided there was a need for transportation. It just evolved from that. Alan Snel can be contacted at 702-387-5273 or asnel@reviewjournal.com. Follow @BicycleManSnel on Twitter.